The Bay Area parkour scene encompasses many traceurs. From San Francisco to San Jose we are all family. The Cave gym is located here, as well as AcroSports. 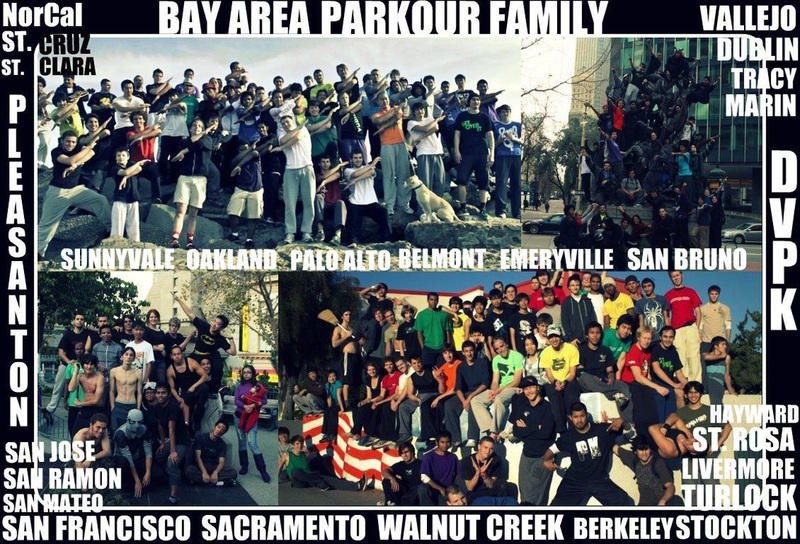 From Berkeley to Pleasanton to Vallejo, the East Bay Is giant, It encompasses numerous cities and parkour groups. There is a session held on the UC Berkeley campus every Thursday night at 6PM, as well as a beginner session every Saturday. In Vallejo you can find Leo Omar and Maxwell Mommsen. Raul Piscoya lives and trains in Pleasanton, but you can find him at almost any jam in the bay. The APEX guys from Colorado founded a gym in Concord. The Parkour Connections gym is in Oakland, as well as the Athletic Playground gym. San Jose Parkour is run by Matthew Trinidade, and Daniel Thai. They are the founders of the San Jose Parkour Team. San Jose is a great place to train. They hold free beginner sessions every Sunday from 9 to 12AM in downtown San Jose.